If you require a durable, resilient and easy to use plastic powerpack case, look no further than the bwh PowerPack range we have on offer at Absolute Casing. Part of our wider plastic carrying case collection, the bwh PowerPack range has been designed to be user-friendly and to provide an incomparable level of protection to the items inside. Manufactured from tough ABS plastic, it features in-line skate wheels as well as an extendable handle system. 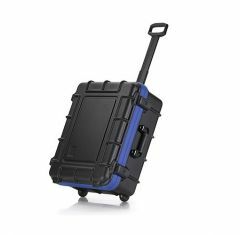 The bwh PowerPack plastic case range we have available comes in a standard black with a blue trim. Screen printed logos can be added to your case upon request should you wish to customise your bwh Powerpack Case for a touch of personalisation. If you would like to include extra protection to the contents of your PowerPack cases, upon request they can be fitted with a custom CNC routed foam fitting. These foam fittings are inserted into the case to provide shock resistant protection to your items. Available in two sizes so you can choose which bwh Powerpack case suits your needs accordingly. These sturdy plastic cases can meet all your storage, transportation and casing requirements. No matter the conditions you wish to use your case in you can rest assured your belongings and valuables will be safely carried from one place to another. To discuss this range with a member of our helpful team you can call us on 01635 579 518. You can also contact us by sending an email to sales@absolutecasing.co.uk - our team will be more than happy to answer any queries you have.